Today Finnair inaugurates a new era in travel between Europe and Asia – and opens a new chapter in its history – as tickets go on sale for its first long-haul destinations to be served with next-generation Airbus A350 XWB aircraft. Finnair is the European launch customer, and only the third worldwide, of the completely new aircraft type, which substantially raises the bar for passenger comfort, environmental performance and operational efficiency. Finnair is also the first airline in the world to operate the A350 on scheduled services to China, where Shanghai will be served with daily A350 service from 25 October 2015. Beijing follows with daily A350 service on 21 November 2015. Finnair’s peak-season frequencies to Bangkok will be served with a combination of A350 and modern, comfortable A330 aircraft from 4 December 2015. Daily services to Hong Kong from 1 February 2016 and to Singapore from 5 May 2016 will also be operated with a combination of A350 and A330 aircraft. Customers can determine the planned aircraft type of their flight by clicking on the flight number during the online booking process at Finnair.com, or by consulting with their travel agent. Changes in aircraft type are possible for operational reasons. Finnair has 19 A350 aircraft on order, and expects to receive the first four by the end of this year. Another seven will be delivered in 2016 and 2017, with the remaining eight to be delivered between 2018 and 2023. Finnair plans to phase out its A340 aircraft by the end of 2017, leaving the entire widebody fleet comprised only of top-of-the-range Airbus A330 and A350 aircraft. Before long-haul A350 operations begin, Finnair will conduct crew familiarisation flights throughout Europe during October. These regularly scheduled commercial services will be operated as usual within the Finnair network, just with an A350 rather than the usual narrowbody aircraft. 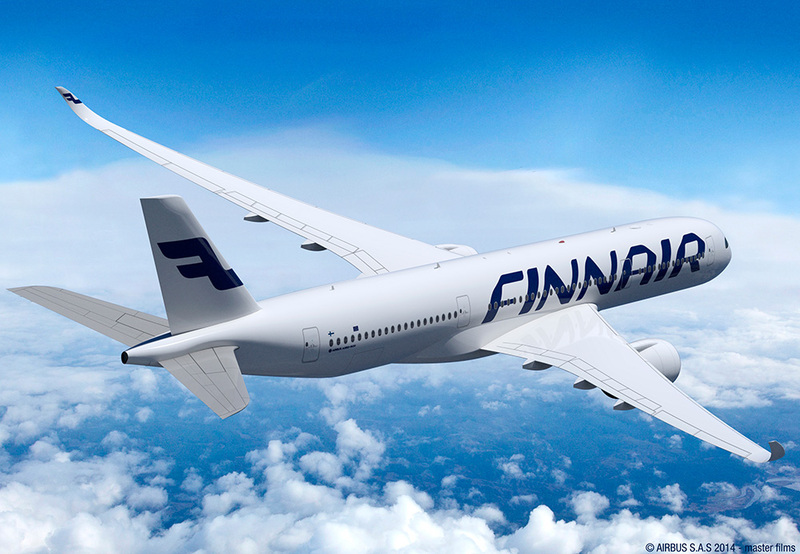 As part of this crew familiarisation, Finnair’s first ever commercial A350 flight will be on October 5 to Rovaniemi in Finnish Lapland, followed in the next two weeks by other European cities such as Brussels, Hamburg, London, Stockholm and Vienna. The full list of planned crew familiarisation flights is published online at a350.finnair.com. All such flights are subject to changes. The A350’s bright and spacious cabin features large panoramic view windows and comfortable seating arrangements in both cabin classes. Gradual changes in dynamic ambient LED lighting ease customers into new time zones and help create a calming and fresh atmosphere. All Finnair A350s will also be equipped with Wi-Fi for greater passenger enjoyment and connectivity. The eco-smart design of the A350 brings more than 25 per cent improvement in fuel efficiency and operating cost over the previous generation of aircraft in its class, significantly reducing the carbon footprint of Finnair and its passengers. The A350 also features an advanced pure air filtration system that changes the air in the cabin every two to three minutes. Draft-free air management, adjustable multiple temperature zones and a higher cabin pressurization also enhance the well-being and reduce the fatigue of passengers and crew. The 297-seat configuration includes 46 seats in Business Class in a 1+2+1 layout, ensuring direct aisle access for all Business Class passengers. The Zodiac Cirrus III seats convert to fully flat beds, while a 16-inch touch-screen inflight entertainment system comes programmed with films, TV shows, music and other digital content on demand in numerous languages. Seats in Business Class also come equipped with AC and USB power outlets. The Economy Class cabin features comfortable Zodiac Z300 slim-line seats with a 31-inch seat pitch in a 3+3+3 layout. At the front of the Economy Class cabin are 43 Economy Comfort seats, which come with four extra inches of leg room as well as noise-cancelling headphones and an amenity kit. All seats in Economy include an 11-inch touch screen inflight entertainment system and USB power outlets.